This amazing glacier is 12 miles long, a half-mile wide and from 300 to 1,800 feet deep. 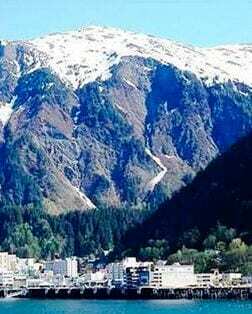 Stretching from the Juneau Icefield to Mendenhall Lake, it has been slowly retreating since the mid 1700s. Enjoy what is truly an outdoorsman's paradise, with activities you won't find anywhere else. Go for a ride on a dog sled, whale watching, hiking, nature watching, flightseeing, ziplining and more. You're virtually ensured a whale sighting from April to November when hundreds of humpbacks feed and frolic in the waters of the northern Inside Passage. Orcas are also common sightings in Juneau. Fly over the massive Juneau Icefield and get a front-row seat to awe-inspiring glaciers, spectacular icefalls and majestic rock formations - accessible only from the air. Discover the life cycle of the Pacific salmon species. Witness their amazing development from tiny fish (year round) to returning adult salmon fighting their way up a 450-ft fish ladder (late-June to October). Indoor aquarium displays showcase local marine life in a natural setting. This 50-acre garden features species native to this temperate rainforest. Guided tours provide insight into a self-sustaining ecosystem and lookout points on Thunder Mountain are spectacular. Meet professional mushers and their amazing canine companions in an introduction to Alaska's state sport. Take a flight to a glacier to experience flying over the snow, or visit the summertime training grounds for a ride in a wheeled sled. For a bird's-eye view, take a five-minute tram ride to the top of Mt. Roberts for a panoramic vantage point 1,800 feet above the city. Mountaintop attractions include trails, shops and nature displays.